I came back last night full of energy! The wedding was so much fun. I wish Matt and Lisa all the luck in the world! The primary shooter was Melissa St. Laurent and we learned so much from each other. I taught her about her camera and she taught me about wedding photography. (She just made the switch to digital) She wants to work with me the future! 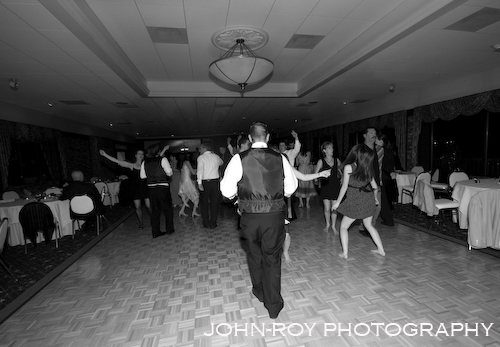 During the reception I tried something totally different, using my wide angle and the pictures came out fantastic! I got the idea from one of the TA's at school, Chris Shelley. He is the one that suduced me to the dark side of photography. I was taking portrait class and he came in and started playing with the wide angle lens and got me hooked. Here is an image from that day. This is Howard and he in one of the film instructors at school. Everyone who has seen this shoot loves it. (Well, except my wife) His friend's and family all think it looks just like him.